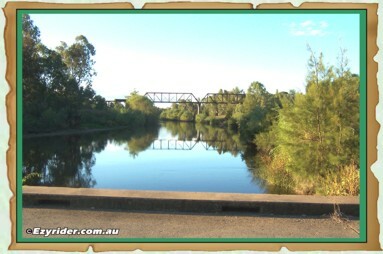 The Manilla River Walk, from the junction of the Namoi and Manilla rivers to Higgins Bridge, just below the Showground, is naturally peaceful. It is a walk of about 800metres. 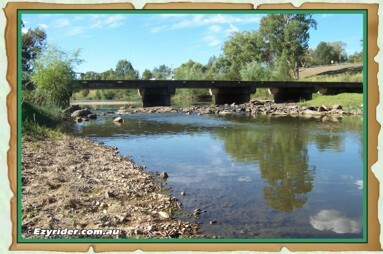 The Higgins Bridge area, with an island, used to be an ideal spot for fishing and enjoying the rapids in the 1950's-1960's. on the bank. He established the first postal service at “The Junction” and named the town Manilla, when the postal service was set up in 1856. 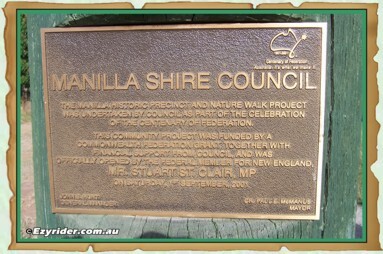 A plaque at the timber arch, at the top of the path, marks the 150 year anniversary of Manilla’s founding. 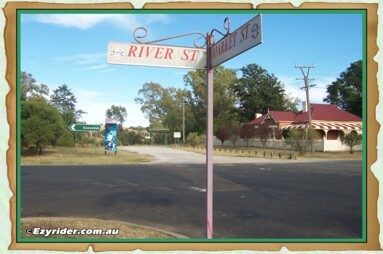 At the corner of River and Market Street shows the entrance to the River Walk. Continue walking under the archway towards the river junction. 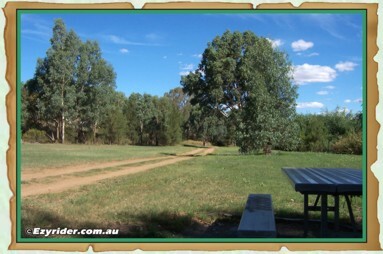 Manilla Shire Council. 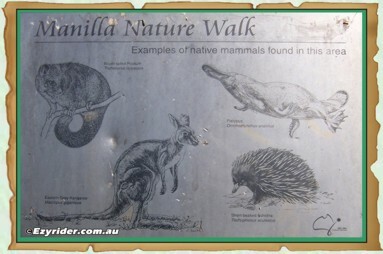 The Manilla Historical Pecinct and Nature Walk Project was undertaken by Council as part of the Celebration of the Centenary of Federation. 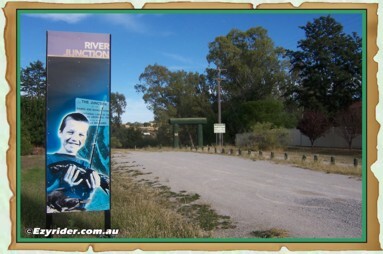 This Community Project was funded by a Commonwealth Federation Grant together with financial support from Council and was officially opened by the Federal Member of New England Mr Stewart St.Clair. M.P. on Saturday 1st September 2001. Left - Just below River Street at the start of the walk near the river. During the 1964 Flood the water rose to almost the top of these trees. 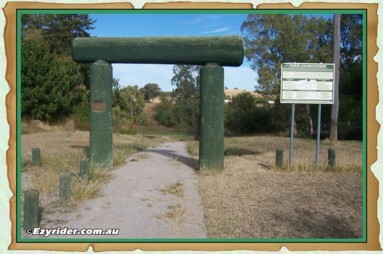 Right - Entrance to the other end of the walk near the Showground area and Higgins Bridge. 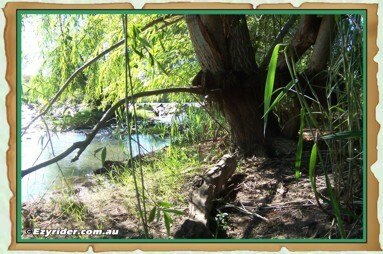 When you walk down the bank to the water area it provides private areas to sit and feel the natural surrounds. 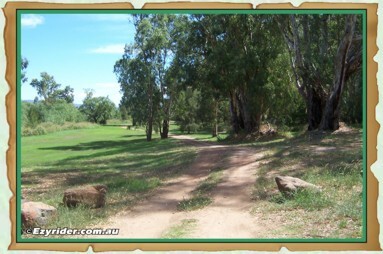 Climbing under the trees on the right, shows an area where the young used to go 'craw-bobbing' during the 1950's-1960's. These pictures were taken during March 2014. 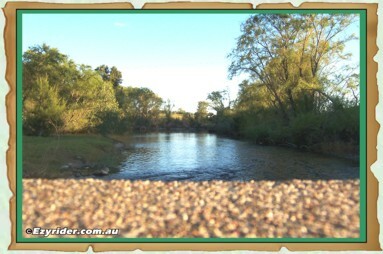 The river was low during the drought. 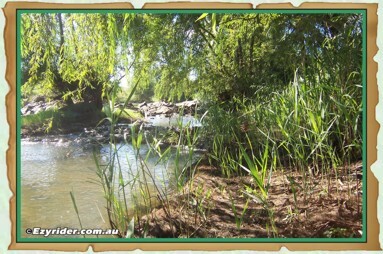 And if you crawl in even further it gives you more of a feel of these isolated and quiet areas beside the river. 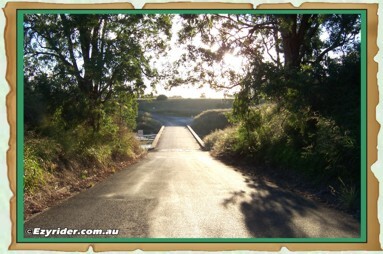 Left - Looking down the road to Higgins Bridge. Right - The low level concrete bridge. Left - The view looking north towards the railway bridge. Right - Looking down stream. Both taken from the bridge during March 2013. 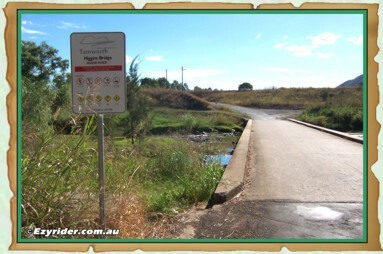 Left - Not much water going under the bridge in March 2014. Looking up towards the right are the Showground areas. 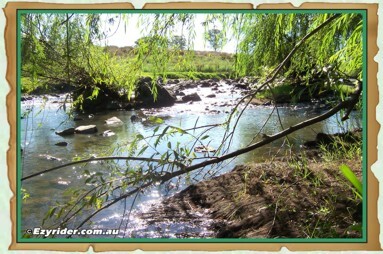 Right - Good fishing, canoeing or just relaxing areas beside the water just down stream. Both taken from the bridge during March 2013. 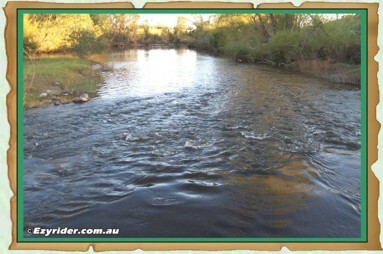 A good amount of water flowing and on the left shows the island in the middle. 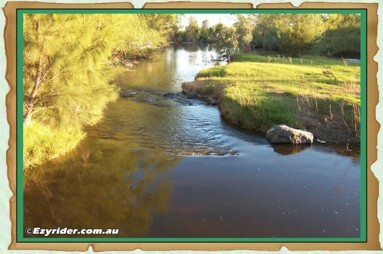 An ideal area for fishing or just relaxing on the island. 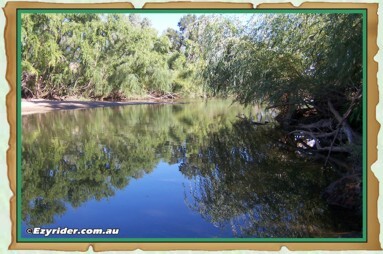 The was the area for trying out a home made metal canoe during the 1950's-1960's. 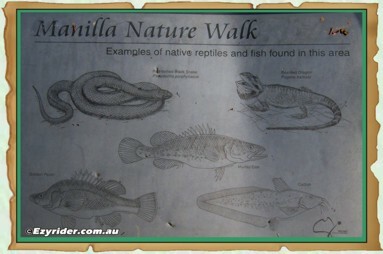 While in Manilla take this walk and enjoy the natural surroundings. It is surroundings like these that one can appreciate the more natural things in life that connect us - Nature. 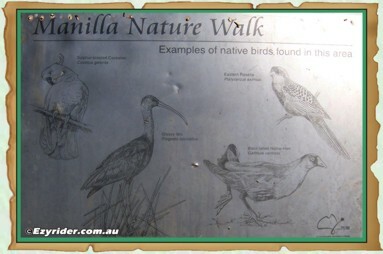 The following pictures are of the plaques set up along the walk beside the river.